Visit Barton’s Brickhouse Boutique this season for great seasonal shopping. We have a house full of items for you to browse! 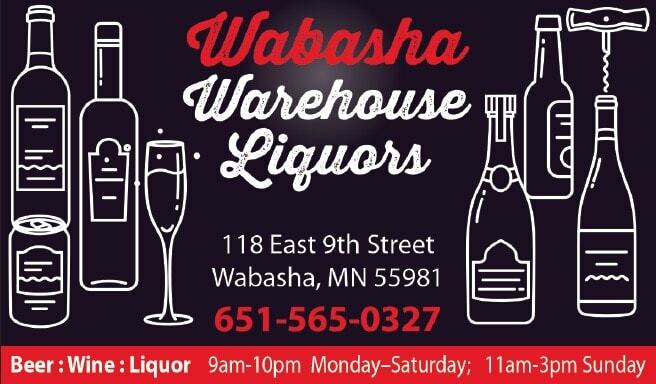 Our boutique is easy to find in Wabasha. We are located on 2nd Street, across the street from the VFW. Look for fun outdoor items in our front yard! Open Everyday May 1st to May 31st from 9:00 AM to 5:00 PM. 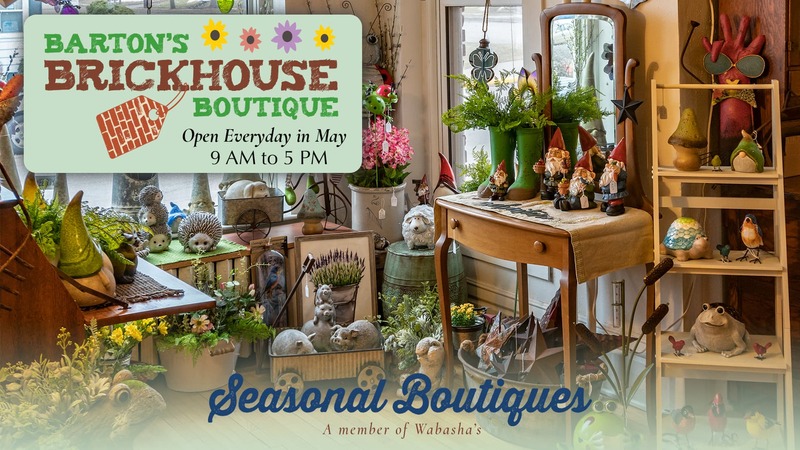 Our Boutique offers a house full of excited new Spring and Summer garden items, farmhouse pieces, lovely floral arrangements and so much more! 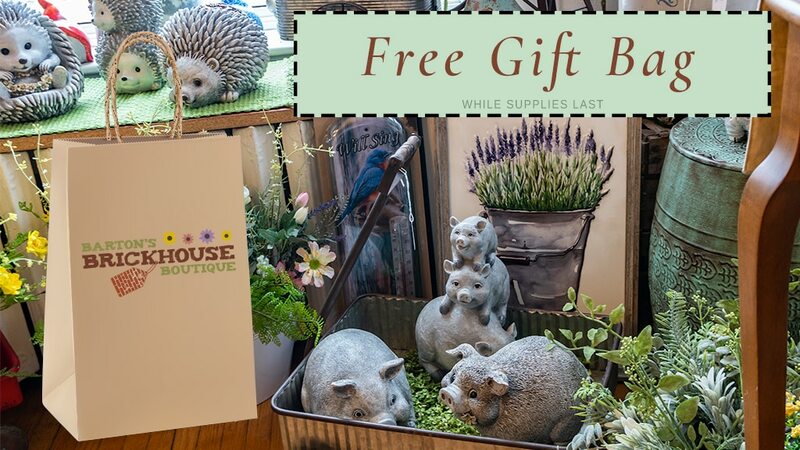 Bring in our coupon and receive a FREE GIFT BAG (while supplies last, one per customer). Open June 1st to August 31st Wednesday thru Sunday 9:00 am to 5:00 pm. Open Nov 1st thru December 8th Friday thru Sunday 9:00 am to 5:00 pm. So far we have partnered with over 50 of the most talented artist, crafts and furniture makers in Minnesota, Wisconsin and Iowa!! The Historic Anderson House is ideally located on Main Street in Wabasha, MN. The front rooms show peek-a-boo views of the Mississippi river and have a spectacular perennial flower garden with ambiance, warmth and cheer. There is a feeling of time being stopped as you meander through the antique filled rooms with the high beds, marble topped dressers, handmade quilts, Victorian pictures, paintings etc. The Anderson House Hotel offers many amenities similar to modern hotels. 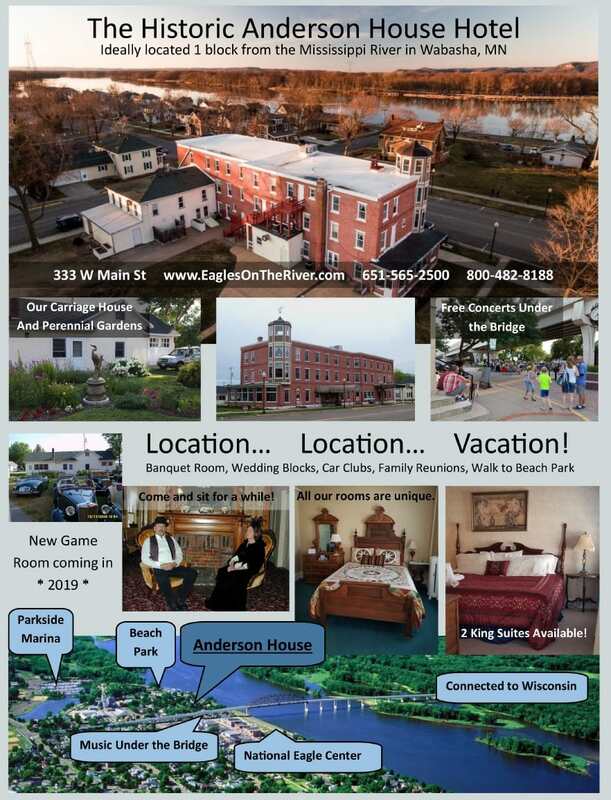 You can book now online http://www.eaglesontheriver.com or call 1.800.482.8188 or 1.651.565.3509 to reserve your special get away! 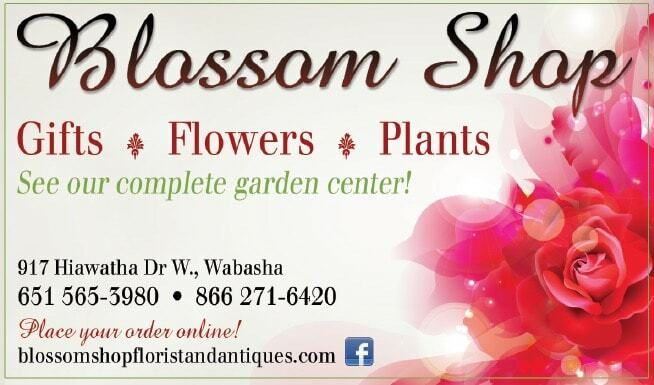 We are a friendly, full-service florist proudly serving Wabasha, Minnesota for over 57 years with the highest quality fresh flower and gift choices available. Convenient store hours: Mon-Fri 9:00-5:00 ~ Sat 9:00-3:00 ~ Sunday for Funeral Work only. We offer daily delivery to hospitals and funeral homes in the area. Rural delivery charges vary, so call for details. 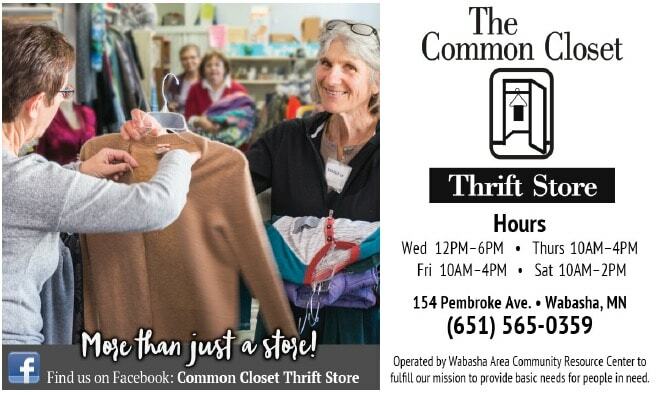 The Common Closet, named the best Thrift Shop in Minnesota, is more than a store! Located on Pembroke Avenue in downtown Wabasha, this unique thrift shop serves multiple purposes and has become an important community outreach program. You can find a wide assortment of gently used clothing for the entire family, household items, furnishings, books and more. When you shop at The Common Closet, you are helping people in need. We are a local arts and craft store that carries crafts, jewelry, essential oils, bath bombs and soaps, candles, homemade jams, cute socks, solar and Night Lights, and much more! 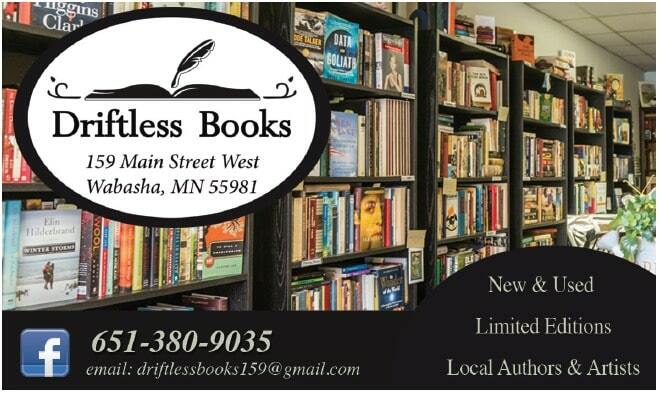 Tucked in the sleepy downtown of rural Minnesota, Driftless Books is home to many classic works of literature, occasional live music, and local artwork. We are your official UPS shippers; guaranteed time-definite and day-definite delivery based on your shipment’s destination. Hoppy Girl Brewing dba Turning Waters Back Alley Brewing Co.
Hoppy Girl Brewing LLC dba Turning Waters Back Alley Brewing Co is now open to the public. We are located on the premises in the backyard or back alley of Turning Waters Bed, Breakfast & Adventure, located at 136 Bridge Ave, Wabasha, MN. With over seven years in the brewing field, head brewer Ford Pearson, has created flavorful, amazing, tasting and down right mind blowing craft beers. You must taste them for yourself. We also offer wine, hard ciders, soda and coffee (upon request) for your refreshments and Pep’s Original Draughthaus Pizzas and Cedar Crest Ice Cream out of Cedarburg, WI. Both of them are made with the freshest ingredients. We are family friendly brewpub with a large outdoor patio. As much as we love animals, we ask that you leave your dogs etc… at home. We prefer a non-smoking space, but have a designated spot outdoors for smoker’s away from the property. Since this is also our home at the bed & breakfast, we ask that you respect our home and our guests staying at the bed & breakfast. If you like fun & games, we have it here; bags/boards, giant jenga, yard dice, cards, cribbage and more….Feel free to bring your favorite game to play. Since we have a license to sell liquor, brew our craftbeer and sell our beer, PLEASE do not bring your personal alcohol on the premises. We have live music from local talented friends now and then so check out our website http://www.turningwatersbrewing.com, Facebook page Hoppy Girl Brewing aka Turning Waters Back Alley Brewing Co or simply call us 651-564-1568. Our hours vary since we are a small business and also house lodging guests in our bed & breakfast. We look forward to set hours when we are in full production of our craftbeer. Thanks for visiting us and we look forward to meeting you. The Best Ribs on the River! 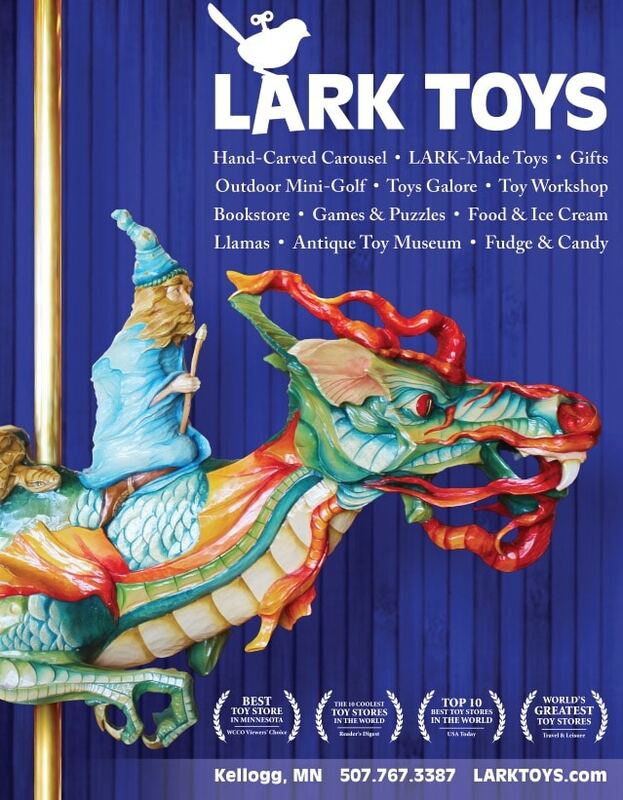 LARK Toys, with over 20,000-sq-feet to explore, is one of the largest independent specialty toy stores in the country. Our knowledgeable family of staff is always happy to assist visitors as they enjoy self-guided tours throughout our unique facility. Our one-of-a-kind hand-carved Carousel ($2 rides every 30 minutes). LARK-exclusive wooden pull-toys & puzzles, made on location. Games & puzzles, science & nature, arts & crafts, puppets, dress-up, musical instruments, dolls & dollhouses, castles, magic, kites, wooden train sets, beach & bath toys, active games, and more. An array of new, classic, and award-winning titles to browse in our Bookstore. Miniatures, collectibles, replicas, nostalgic items, gag gifts, novelties, plush, vinyl, wood, tin, and wind-up toys. Memory Lane, our antique toy museum, with hundreds of toys & games on display. A Candy Store filled with taffy, gourmet jellybeans, and other timeless favorites. Behind-the-scenes glimpses at our ongoing projects, creations, and renovations. A beautifully landscaped 18-hole Miniature Golf course, featuring a play-through mountain, waterfalls, ponds, streams, and the scenic bluffs of the Mississippi River valley on the horizon. Family owned & operated, LARK Toys is committed to offering high-quality, healthy, developmental products & services, and maintaining an environment that enriches social understanding, creativity, imaginative play, and fun for children of all ages. RECENTLY VOTED MINNESOTA’S FAVORITE TOY STORE! This landmark interpretive center is a destination on the banks of the Mississippi River that connects people to eagles in nature, history, and cultures. Home to five permanently injured bald and golden eagles, visitors can meet the eagle ambassadors up-close in a truly unique setting, enjoy daily classroom programs, explore two floors of interactive exhibits, and view wild eagles over the river. The National Eagle Center is open year-round (10am-5pm daily) and offers seasonal programming and events. For a complete listing, visit the website calendar. 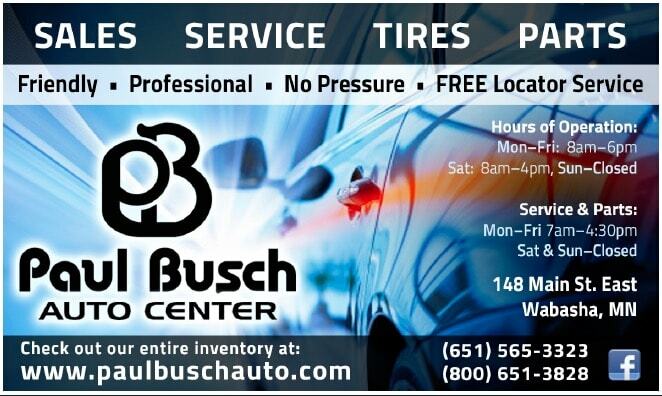 Paul Busch Auto Center, Inc. Car Dealership and More. Full Garage with Certified Mechanics. Tons of inventory. Call to see what’s available today! 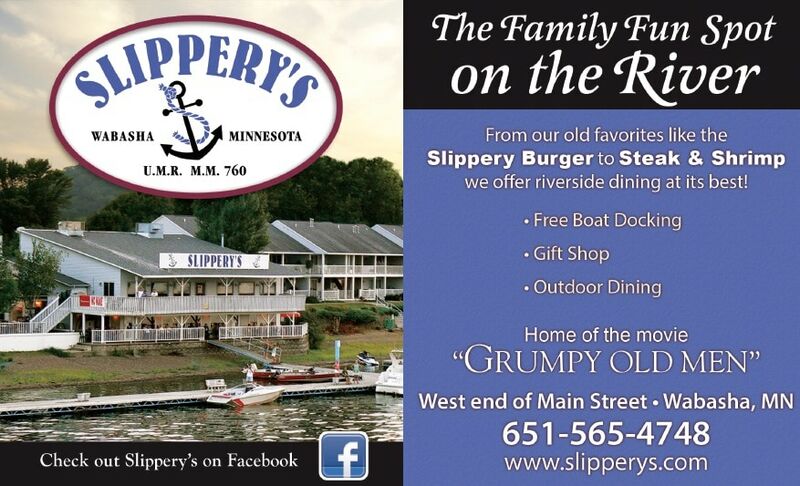 Home of the famous Grumpy Old Men movies… Slippery’s offers a full service bar and restaurant located on the main channel of the Mississippi River. Pull your boat up and stay for a while… we have a 200 foot dock right on our property for easy walk up and sit down service! During the summer enjoy specials on our patio bar! We have a full banquet room for up to 200 people! Stonegate Studio and Gallery, welcomes you to visit us in Wabasha, MN. Stonegate Gallery offers decorative art, seasonal art, handmade jewelry and one of a kind commissioned artwork in glass and mixed media for your home, business and public spaces. The gallery is open around the seasonal events that happen in city of Wabasha. Stonegate Studio is the personal studio of artist Jeffrey Stenbom located in the back half of the building. Please stop by and say hello! New creations being made daily. 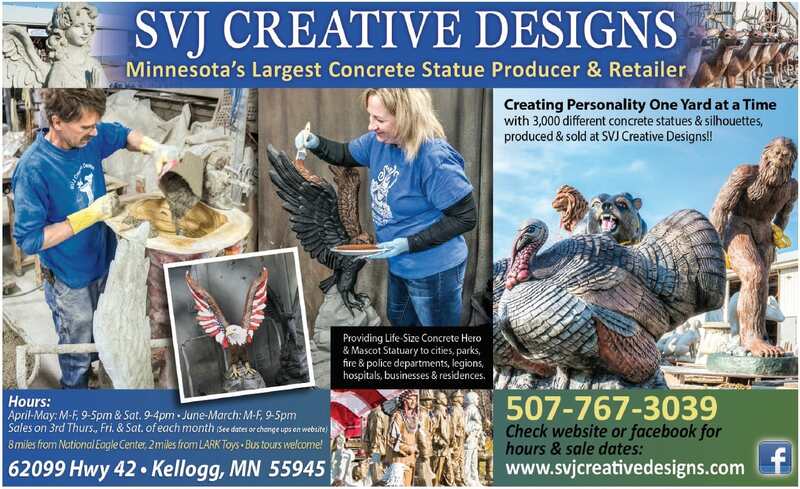 Minnesota’s largest concrete statuary producer. Watch as statues come to life from sand & rock to the finishing stages of painting and display. Check out our face book page or website for exact hours, new statues and unadvertised sales: http://www.facebook.com/svjcreativedesigns Garden paths. Endless selection of concrete statuary made right here in Kellogg, Minnesota. Not made in China! We are open Monday – Friday, 9-5pm. We are now closed most weekends unless by appointment. We are open every third Saturday of the month. In the colder months, dress warm as it is outdoor shopping. Thanks and see you soon! On days that you see we are closed, please call ahead just in case we might be on the premises and if we are, we would be more than happy to assist you. 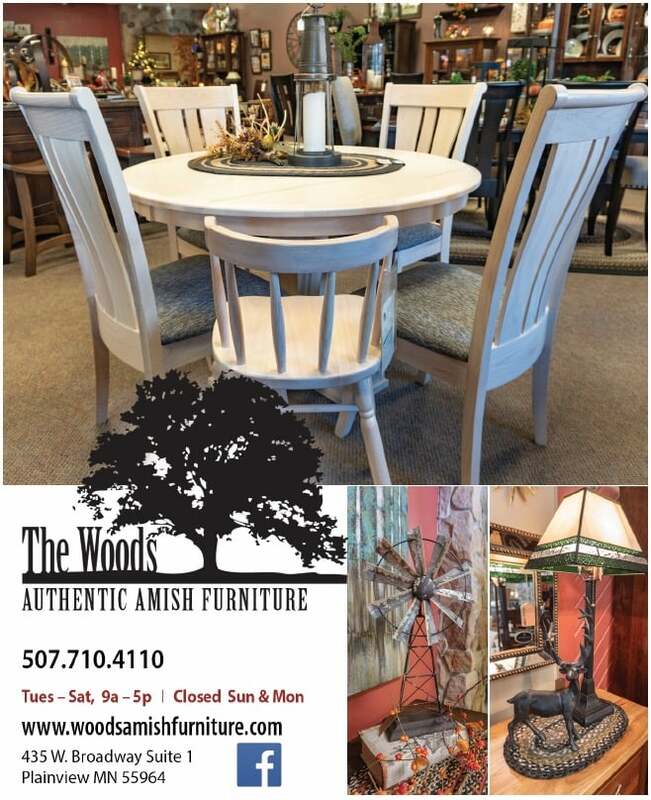 Come visit our spacious showroom while enjoying a unique experience in quality Amish furniture and home accents. We offer various styles of furniture and home decor- modern to contemporary- urban living to casual country-mission to traditional and everything in between!! Shop our store for Lake Pepin, Mississippi River and Lake City apparel. We are your exclusive source for Pepie, the Lake Pepin Monster apparel! Fun seasonal decorative items, jewelry, books, accessories, Old Guys Rule brand and a section of kitchen ware will provide you with many gifting options– from our primitive room to our nautical and beer/wine themed rooms, we truly do have something for everyone! We love locally made products and carry lots of them in our store including, honey and free-range eggs, soaps, candles, jewelry, home accessories and of course our own fudge and chocolates made on-site! Just one block off HWY 61, and only one block from the Lake City Marina. You can find us on Main Street West & Allegheny Avenue next to Hill’s Hardware on Wednesdays from 3-7 pm and Saturdays from 9-noon mid-May through October. Product available will include a variety of fresh local fruits and vegetables, eggs, meats, baked goods, canned goods, flowers, locally produced craft items and more! Wabasha Farmers Market now accepts EBT/SNAP/DEBIT and CREDIT cards. Stop by our information booth for more details! New vendors are always welcome.